Lord we need something brand new. It can only be done with our eyes on You. Built to last a lifetime long. Brick by brick the price has been paid. Our gain of Heaven in Christ’s brief loss. You still do this here and now, don’t you, Lord? You, Oh Lord, are the only way. Happy Resurrection Sunday dear friends! Praying we all set our hearts and sights anew today. Jesus is continually in the business of making all things ~ and anything ~ new. No better time to start than today, Easter Sunday 2019. He knew the day His one and only perfect blameless Son was brutally beaten and murdered what was coming next. He knew He had a plan of redemption for not just His Son, but for anyone who believes and accepts His love, grace and forgiveness. And sometimes that’s hard for me because I want to know what’s next. I want to know what’s coming so I can be prepared. Braced and ready for whatever. But I’ve always heard that when someone about to have a wreck tightens up because they know a collision is about to happen, their injuries are worse and they are more sore than if their body hadn’t of known what was coming; if they had just gone with whatever happened next. So while sometime this blind-sighting of pain or tragedy can feel like a betrayal by God- we must know He is not a god of betrayal. He is a good God who loves us more deeply than we can imagine. He knows what’s next but He also knows there’s always a way out and a plan of redemption and healing. In Him, through Him and only with Him. He knew what was next that gruesome Friday. He knew Sunday was coming. Wow, we’re 2 days into 2019. Someone tell me where 2018 went?? I’m already feeling like I can’t keep up- I can’t decide on a word for the year…maybe a handful will do?? Maybe I should just choose the word “simple” and that would solve all my problems- ha! While I don’t feel my mental calendar has flipped the page to 2019, it’s here and with each new year, for me, comes the desire to change up a few things in my life. It’s a time to reflect on the previous year and set some goals or “resolutions” to be better in the following year. You do it too, right?? Over the years, I’ve set many of these so-called resolutions, but I find, so often, they don’t stick. I can remember starting a read-the Bible-in-a-year devotional (more than once! )…I made it to about maybe mid January. I know I started several new workout regimes only to fall off the wagon soon after I got on. Why is this?? Is it because we are relying upon our own strength and will to set and accomplish these new goals?? Are we setting ourselves up for failure by expecting too much? What would happen if we prayerfully considered and established goals, words or verses for ourselves and relied we on the power of the Holy Spirit to see things through? What would happen if we resided to rest in Him and the grace He offers when we forget or don’t follow through on those new year commitments?? What if we took the pressure off of ourselves to perform and humbly allowed Him to move and work in our hearts and lives? Last year my word of the year was courage- and while I ignored it on some days, there is a vast difference in my courage level from one year ago. HUGE, actually. And it’s because of Him. I’ve struggled with fear most of my life. I still do at times and probably forever will, but who knows, with God all things are possible, right!? So, for me, courage was the perfect word last year. And please know I have in no way reached a pinnacle of “courage” perfection- ha! As I reread my “courage list” I see many areas I still need him to move mightily in! This was the cheesy picture I sent my friends as we all shared our words of the year. And below are the words I wrote as I began 2018, the places I needed God to help make me brave. Courage: the ability to do something that frightens one; strength in the face of pain or grief; bravery, valor, FEARLESSNESS, audacity, boldness. The courage to trust the Lord. The courage to let go. The courage to be authentic. The courage to be bold in faith. The courage to be different. The courage to go against the flow. The courage not to yell. The courage to speak the truth with love. The courage to love freely, openly and with no regrets. The courage to speak and speak up. The courage to give to others. The courage for missions when it’s scary. The courage to only seek Gods approval. The courage to be consistent disciplining my children. The courage to say yes. The courage to say no. The courage to take the risk even though I’m afraid. The courage to let others in. Their courage to ask for help. The courage to be kind. The courage to be humble. The courage to do His will. The courage to think before I speak. The courage not to cry. Funny–is it just me or is the word “courage” starting to look misspelled? It’s interesting how looking at a word so long can do that. Even if we say it too much it might start sounding strange. Which was probably good that everyday I didn’t just wake up and say, “COURAGE!” or continuously repeat the word to myself– it was there when I needed it and an unspoken between the Lord and me. I didn’t rely on the word “courage” to help me but somehow rested in Him and His unfolding of new courage in areas I’ve longed to be more brave in. It’s been like a river He has taken me through, guiding me with the current, developing courage subtly and slowly, without me really even realizing it until now as I reflect upon Him moving and working in my life in the last 365 days. Maybe before 2020 I’ll have the courage to pick just one of the many words on my heart for 2019 and get back to my initial point of this post! 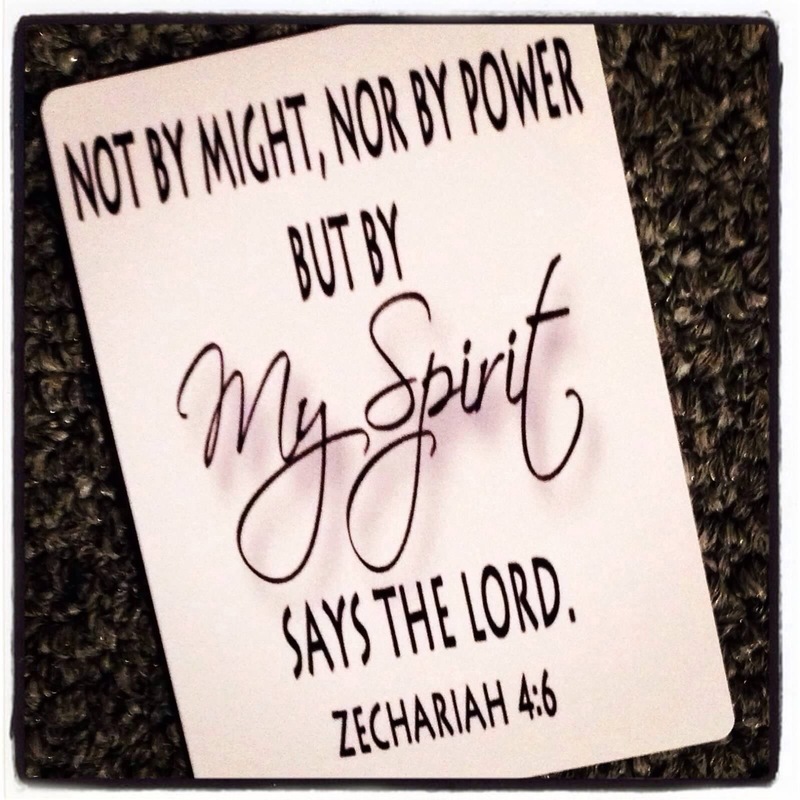 Not by might now by power but by HIS SPIRIT. His Spirit will help us in ways we don’t even see or know. Happy New Year friends, love y’all! Thank You, Sweet Jesus for working in ways we can’t even see. Thank you for being so good and faithful even when we are not. I pray today that we feel your love and grace and rest in the plans You have to carry us, mold us and make us new. I pray we press into this new year and forget the things behind. I pray we are steadfast in seeking You and that we wake each day with purpose in our hearts- Your purpose for us. Daily may we give ourselves to You. By humbling ourselves, listening to the Spirit’s leading, and letting You guide us as we determine our goals, word, motto, and/or verses of the year, help us purposefully put them into action each day. May we go into this year with Your grace in our arms knowing that even if we slip, mess up or fail all together, nothing will change Your love for us. In Your saving Name I pray, AMEN. This was a recent guest post on my friend Emma Mason’s blog (link here). Thought I would share with you all too! Merry Christmas Eve! A few weeks ago, while decorating the house for Christmas, I came across our nativity scenes. We have two and they both make me super happy because they are both so special. One was a gift from my parents many years ago and the other belonged to my paternal grandmother. Unfortunately, one nativity scene has several pieces that have broken over the years- baby Jesus’ hand, Mary’s hand and this year, I noticed Joseph’s hand was somehow knocked off. The other nativity scene was in pristine condition as I carefully pulled it from the box then WHAM! I clanked the pieces together and off fell Mary’s left hand. UGH. As I glued the hand back on I couldn’t help but think of the position of Mary’s hands reflecting the position of her heart. Both hands in this figurine are open to Jesus. Yes, she is His mother, but before God even opened her womb she had opened her hands and heart to Him. Now let’s just stop for a minute and put ourselves in her shoes- I think I might have laughed like Sarai did in the Old Testament if an angel had come to me and told me the news that I would be carrying God’s One and Only Son. The Word, God in human form…the One that was promised long ago to be our Wonderful Counselor, Mighty God and Prince of Peace. The One everyone had been waiting on. I also think I would be very, very afraid of what was to come and what others would think. Maybe that’s why He chose her…But honestly, if we are children of God, we are all chosen to have open hands and open hearts to whatever He has for our lives, right? I don’t know about you, but sometimes I feel my hands are clenched tightly. I lay in bed at night and must consciously relax and open my hands. It seems they have developed a need to retreat to a position of being closed. Has my heart assumed this position too? Maybe my hands are closed because I’m tense or anxious and that’s where it all goes, maybe because I have a phone in my hand so much of the day my hands just assume that position, or maybe it’s my age- I did turn 40 this year? Who knows… but it’s something I must continually do and have become very aware of. Open my hands, stretch out my fingers. Keep my hands open. Back to my heart- shouldn’t I practice this same exercise here too? Each day wake up and stretch open my heart to the Lord. His ways, His words, His voice and His plans for my life…even and especially if they look different than what I had planned. Keep my heart open. I’m fairly certain carrying baby Jesus and giving birth to the One who would save people from their sins was not what Mary or Joseph had in mind as they were beginning their relationship. And surely, they had no idea what his life would entail- the criticism, ridicule and His brutal death. And yet, they were the Lord’s servants. Open hearts and open hands to do His will. Somedays my hands and heart are humbly open to the Lord…other days, they are closed tightly around the things I hold dear and my heart seems shut down and far from him…which begs the question-what truth about God am I not believing? As I type this, tears are brewing in my eyes because I know what often holds me back- I don’t know what’s next. But neither did Mary. Neither did Abraham as he walked his only son Isaac up the mountain to the altar. When I think of Jesus in the garden of Gethsemane as a grown man begging God to take the cup from Him because He knew what was coming yet He still humbly responded with an open heart and hands, “…not my will but Yours be done” (Luke 22:42). With my fists clenched and heart closed off I’m not believing that His ways or plans are good, or that no matter what’s around the corner, He is good still and can bring good from any situation. I’m not believing He truly loves me. I can’t control people or circumstances, so my hands and heart assume a closed-off position while holding tightly to what I can because I know that sometimes our biggest fears come true. Sometimes people hurt others, babies die before they even breathe a breath and we cannot make sense of the tragedies we see or experience. BUT- I cannot look to or think about these things more than I look to, think about and believe the truths about God. His promises for good, to be our comfort, for peace and joy, the promise of HEAVEN. The promise and help of His Spirit when bad times come, the promise that His character is ALWAYS GOOD and even though this world is often hard, and disaster comes, HE CAN BE TRUSTED to bring good. Somehow, someway. IF we look to Him for help with open hands and hearts. Keep my hands open. Keep my heart open. Our 7-year-old son has placed two gifts in his stocking- one for Santa and one for Jesus. How sweet that he is giving something to Jesus this year for His birthday. I mean, we do leave Santa and his reindeer cookies and milk, right? Of course, we should give something to the Lord as we celebrate His birth. I want to end this post asking, what will we give Jesus this year? What gift can we give Him? Can we give Him our clenched fists, so he can open them? Can we give Him our broken hands, so He can heal them? Can we give Him our whole hearts today and every day? Can we truly say, “I am Your servant…Your will not mine”? I think we can. After all, with God all things are possible. Lord, thank You for Your Word filled with many promises we can cling to. Thank you for the many humble, broken people in the 66 books of the Bible that can teach us how to open our hearts and hands to You. Forgive us when we don’t trust You or when we question Your will or ways. Help us get to a place of surrender. Keep our hands and hearts open to You for salvation, Your Spirit, guidance, comfort, peace, joy, grace and to be used by You. May we gift you our hearts and hands this Christmas. May our eyes see you and look to you, not our circumstance or what if’s. If we are going to clench our fists may it be because we are holding tightly to You and the promises of You. The now and always of You- You are a good God, You love us, Your ways are good, and we can trust You. Happy Birthday, our Savior and King. May Your will be done. In Your mighty saving name, I pray, Amen. Reflecting on 2015, I failed a lot with this word and this verse, but looking back I did learn and can see God’s unending grace in those places I didn’t surrender or allow His Spirit to help me. It’s very easy for me to surrender when the house is quiet and everyone is asleep, whether it’s 2 am or 6 am…but what happens to my surrendering when my littles are up and the rush of the day starts? It often goes out the window with the first (or second or third) confrontation or cross word from a family member, or even a frustrating inanimate object (anyone else know what I’m talking about!?). Ugh. How I wish I could stay in a sacred spot of sweet surrender instead of letting life’s chaos, circumstances, and my to-do list sweep me out from that place, but as the Bible tells us, “…the Spirit is willing but the flesh is weak.” (Mark 26:41b) Oh yes it is. Surrender is a constant redirecting of our wills to align with God’s. My will is pretty strong so this isn’t always natural, easy or consistent, but I know so many good things come out of a surrendered heart. Surrender gives me the ability to love, forgive and give grace in the most difficult circumstances. Surrender is love, it is forgiveness, it is grace. It keeps me in the place and position to love and not criticize, to forgive and not grow bitter or angry, to give grace and not judgment. Surrender is freedom. It’s life, victory, peace, joy, purpose, etc…It’s so many good, good things from a good, good God. In surrender we trust God. It’s sanctification at it’s best and in it we are under the complete authority of our Creator and are greatly guided by Him. He doesn’t force us to surrender, although sometimes I wish He would. He leaves it up to us, it’s our choice; a deliberate commitment necessary to live the life He has called us to live. A life in tune with Him, a life devoted to Him, a life made abundantly full, whole and complete by Him and through Him. Surrender is taking everything I hold on to so tightly and laying it at my Savior’s feet, giving it to Him- my children, my husband, my marriage, this pregnancy, my fears, strongholds and insecurities. It’s trusting Him with my prayers and dreams and believing He will answer them according to His plans, not mine. It’s letting Him have me. It’s choosing to breathe and ask Him for help when my kids are not listening and driving me crazy and all I want to do is yell at them. It’s doing what God has called me to do, even if it goes against the flow; seeking His approval above all else (agh, a tough one for this trying-to-be-ex-people-pleaser). It’s letting go and letting God; saying “YES” to Him and knowing that He has equipped me for whatever He is calling me to do. It’s slowing down and being in the moment, each moment and breath a gift from God to be used for His glory, not my fleshly desires. Surrender is choosing to stop and think before responding to someone, because a lot of the time what I really want to say doesn’t line up with what the Lord would have me say. It’s choosing to pause before reacting in a harsh manner towards someone who has offended or misunderstood me and letting God give me the words to say- or not say. It’s letting Him guide me, knowing He is always fighting for me, I just need to be still. It’s giving Him my thoughts and emotions and allowing Him to drive my actions, not my fickle feelings, keeping my eyes on Him, not on what’s going on around me. It’s knowing this life is fleeting, just a vapor, and we are only here a short time. Bottom line, surrender is allowing God to not only be Lord of my life as I claim but to be Lord, King, Ruler, Decision-Maker of my day, my to-do list, my schedule, my relationships, my words, my thoughts, my all. A friend recently asked when Jesus became real to us, and for me, Jesus becomes real when I surrender. Not that He isn’t real when I’m not surrendering but His awesomness and power are extremely evident in my heart, soul and life when I get out of the way and let Him move and work and mold and do His job. As I end this year, I am hopeful. Hopeful that the lessons learned on surrender throughout 2015 will be stored in my heart with gratefulness, knowing how perfect and strong our God is and how imperfect and weak I am. Never forgetting that God can bring good from any situation, even the worst of them, and committing to staying surrendered even if this good might not look exactly like I thought it would. I do pray for my mind, heart and soul to surrender more consistently and deliberately in 2016. Knowing my prideful independent self will at some point resist Him, I am grateful that He will guide me and my strong will back to the spot of sweet surrender never ceasing to give me abundant grace along the way. Dear sweet, sweet Jesus…You made the ultimate surrender when You came to earth, lived, died and rose again for us. You came to do your Father’s will…oh that we may do the same! Your will, not our own. Our lives are Yours! Use us, guide us, direct us and keep redirecting us as we find this place of surrender to You, the One who knows us better than we know ourselves and has a plan of our lives that is far greater than anything we could ever imagine. May we surrender it all, not just the places that are easy or comfortable. We are thankful for Your grace, Your kindness and Your love. How can we ever repay you but to live wholly for You and You alone. Help us get out of the way, help us to only hear and heed YOUR voice and no one else’s. We thank You for the freedom and fulfillment you bring in surrender. In Your Holy name, Amen. ~Do you do a Word of the Year? My friend, Heather Patterson, first gave me this idea and I’m so grateful! Click here to read her blog series about a Word of the Year!